Ah, what does everyone want for Christmas? A lot of head. Heads. Little heads to cover your walls with grim faces. Antique English heads. Do you need head from Britain? 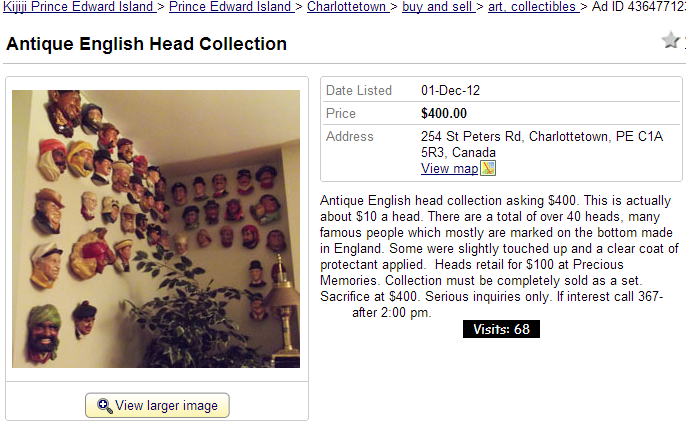 Perhaps $400 is a small price to pay for this much head. Make your loved one happy by giving them head this holiday season. 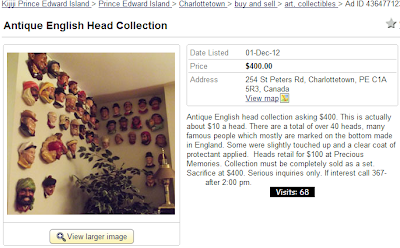 Antique English head collection asking $400. This is actually about $10 a head. There are a total of over 40 heads, many famous people which mostly are marked on the bottom made in England. Some were slightly touched up and a clear coat of protectant applied. Heads retail for $100 at Precious Memories. Collection must be completely sold as a set. Sacrifice at $400. Serious inquiries only. If interest call 367-5380 after 2:00 pm. Everyone wants to get ahead, don't they?